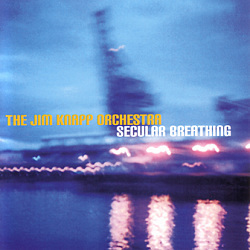 “Secular Breathing” is the long-awaited third CD by the Jim Knapp Orchestra. One of the most respected composer/arrangers on the west coast, Knapp’s concept of ensemble music started at a high level and has evolved in the intervening 25 years to a uniquely identifiable sound. Like Duke Ellington and Gil Evans, he tends to combine instruments in ways that create textures infrequently encountered in big band music. Woodwind doubles and French horn suggest symphonic winds at times, but there’s also a quirky, understated humor that reveals his playful wit.